The Kingfisher, an award winning greenhouse from Swallow GB, a company well known for producing high quality timber greenhouses. The smallest of the Swallow range with a width of 6'8 (203.5cm), the Kingfisher is available in varying lengths from 4'3 (1.29m) up to 20'10 (6.36m). An extremely popular model with a single door and spacious interior, this greenhouse is perfect for the novice or professional gardener. 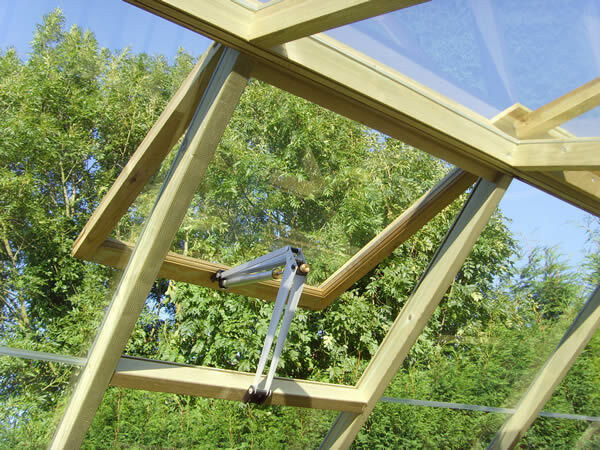 Superb value for money, each greenhouse includes roof vents with automatic openers and staging. The standard price also includes both delivery and install (within mainland UK, extra charges apply for addresses 15 miles north of Glasgow) by the Swallow team. New for 2011, the Kingfisher can be painted for an additional charge, choose between Somerset green, Willow, Sea grass, Black Ash, Maple leaf and Seasoned Oak from the Cuprinol Shades range. Please contact us for further details and pricing. Kingfisher Wooden Greenhouse 10'5 x 6'8 (318m x 2.04m) constructed using redwood pine and pressure treated in a green tint. Includes Free Installation! Kingfisher Wooden Greenhouse with single door 14'8 x 6'8 (4.47m x 2.04m). Featuring four roof vents, with automatic opener and staging. Includes Free Installation! The award winning Kingfisher Wooden Greenhouse 16'9 x 6'8 (5.10m x 2.04m). Featuring four roof vents and staging down one side. Includes Free Installation! Kingfisher Wooden Greenhouse 4'3 x 6'8 (1.29m x 2.04m), in pressure treated timber. Includes Free Installation! Kingfisher Wooden Greenhouse 6'4 x 6'8 (1.82m x 2.04m), an attractive greenhouse for any keen gardener. Includes Free Installation! Kingfisher Wooden Greenhouse 8'4 x 6'8 (2.54m x 2.04m) in redwood pine and pressure treated in an attractive green tint. Includes Free Installation!